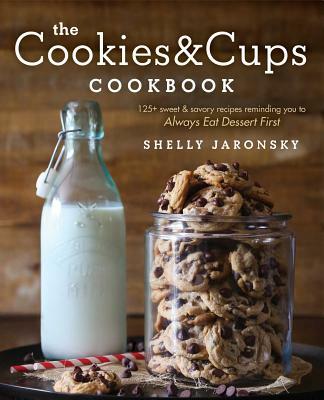 Wildly popular Cookies & Cups blogger Shelly Jaronsky's eagerly anticipated cookbook features all-new, mouth-watering, delectable sweet treats 100% guaranteed to make you want to eat dessert first. Shelly Jaronsky has a problem. She's an addict. Of the buttercream variety. "Chronicling my life in sugar" has been Shelly's motto since the inception of her insanely frequented dessert blog, Cookies & Cups. With recipes ranging from the deliciously decadent (her S'mores Fudge Bars will make you seriously reconsider everything you thought you knew about baked goods) to the deceptively simple (her Favorite Chocolate Chip Cookie will become an instant staple in your baking repertoire), The Cookies & Cups Cookbook truly has something for everyone, from the cooking novice to the seasoned chef. Now you can bring Shelly's signature style into your own kitchen with more than 125 no-fail recipes, including some reader-approved favorites and a special bonus section dedicated to the quick and savory side of cooking. Authored in the witty, intimate style of the blog that draws more than three million monthly page views and a social following of more than seven hundred thousand fans, The Cookies & Cups Cookbook is the go-to source for all things flavorful, accessible, and irresistibly tasty.